Buy 3 or more, get 10% off Conti tubes. Subject to availability. A simple formula for a simple application – but funny how the competitors manage to miss the details. Mold-cured, seamless-extruded, with removable valve cores are features that make Conti tubes a step above the rest. Price varies based on tube type. Great all around tube for your road bike by Kenda. X-Long 80mm Presta Valve with removable valve core. 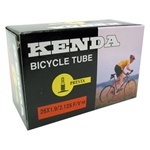 Two great all around tubes for your road bike by Kenda. Longer 48mm Presta Valve. Great all around tube for your road bike by Kenda. Longer 60mm Presta Valve with removable valve core. Includes two Maxxis Ultra Light Tubes. Includes two Kenda Off-Road Bicycle Tube, 26 x 1.9-2.125. Includes two Kenda Off-Road Bicycle Tube, 29 x 1.9-2.3. Two great all around tubes for your road bike by Kenda. Available in 650x18-23, 700x18-23 or 700x23-25. Great all around tube for your road bike by Kenda. Fits most standard non aero wheels. Available in 650x18-23, 700x18-23 or 700x23-25. Great all around tube for your mountain bike by Kenda. Long lasting performance for your 29er mountain bike by Kenda, the makers of the Nevegal and Small Block 8.